A perfectly simple way to serve small, tender, new potatoes! The recipe may be simple, but the flavor is delicious! My brother came home with a 50 pound bag of seed potatoes early in the spring. He has been planting giant gardens out at my parents' property for a couple of years and now that my parents' can have a large garden at their homestead, he has extra room to spread out. Last year he was almost exclusively a pepper farmer. He picked out quite a few varieties and started them from seed in his basement. 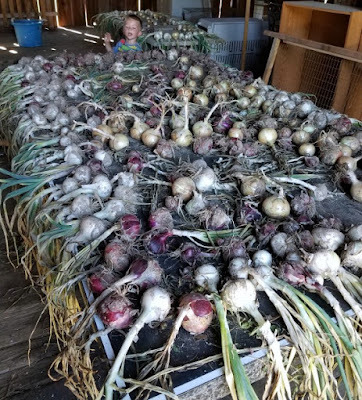 He kept a few in pots in his backyard and the rest went to "the farm." He visited them every week, got them on a little irrigation system and harvested way more peppers that he could ever dream of eating. He pickled some peppers, made at least 3 different varieties of hot sauce and gave them away by the bucketfuls. This year he vowed to scale back. Which he did, on peppers at least. 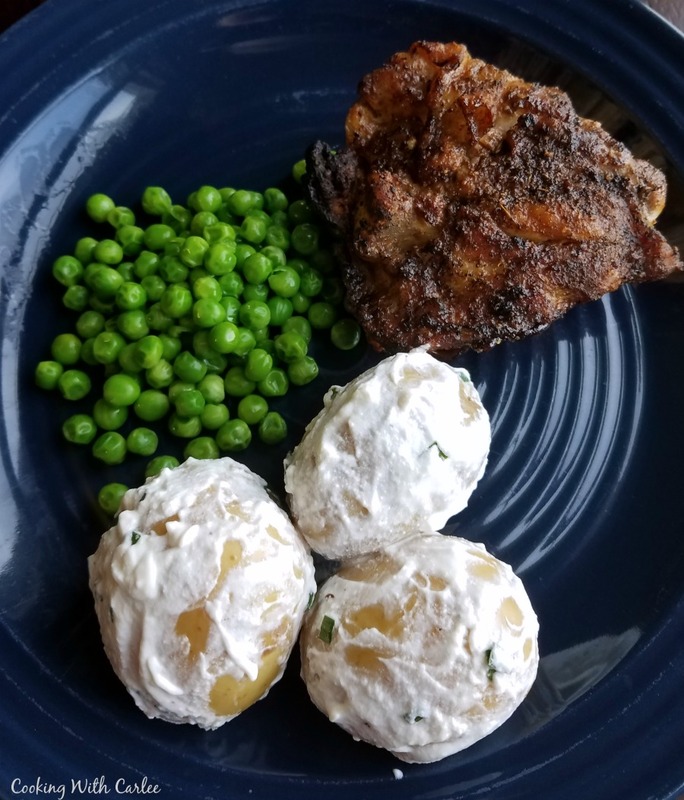 But he made up for it in zucchini, pattypan squash, onions and 50 pounds of seed potatoes! To be fair, he did share some with my parents. But he still got plenty of his own! 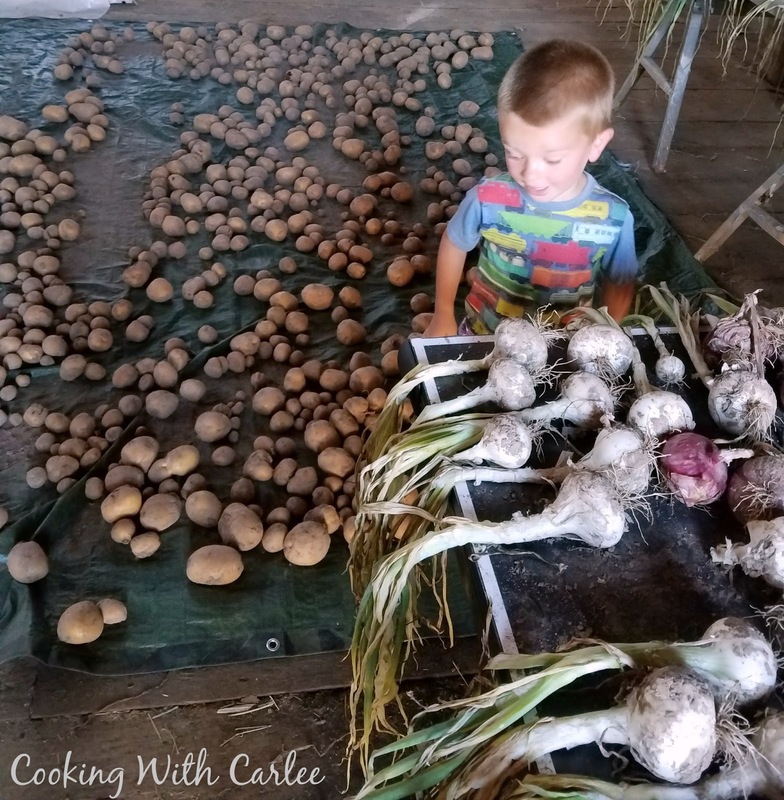 Just look at the potatoes and onions he harvested last weekend. All of this to say I can't wait to have some fresh delicious potatoes! My mom made a recipe like this a couple of years ago and we all thought they were great. So when I had a bag of small, tender golden potatoes I couldn't wait to recreate them. I searched online for a while and couldn't find what I was looking for. She couldn't remember exactly either, so we put our heads together and came up with these. If it's not exactly what she did back then, it's pretty darn close! It might not result in the prettiest side dish to photograph, but I can assure you that your family won't mind. Unless of course they think every meal needs to be Instagram worthy! Besides, they are simple to make and delicious and that is what really matters. This is a simple and delicious way to serve small thin skinned new potatoes. Clean your potatoes and place them in a large pot of cold water. Bring to a boil and continue to boil until the potatoes are tender. This will depend on the size of the spuds, but about 10-15 minutes. Drain water and toss potatoes with butter. Sprinkle with salt and pepper. 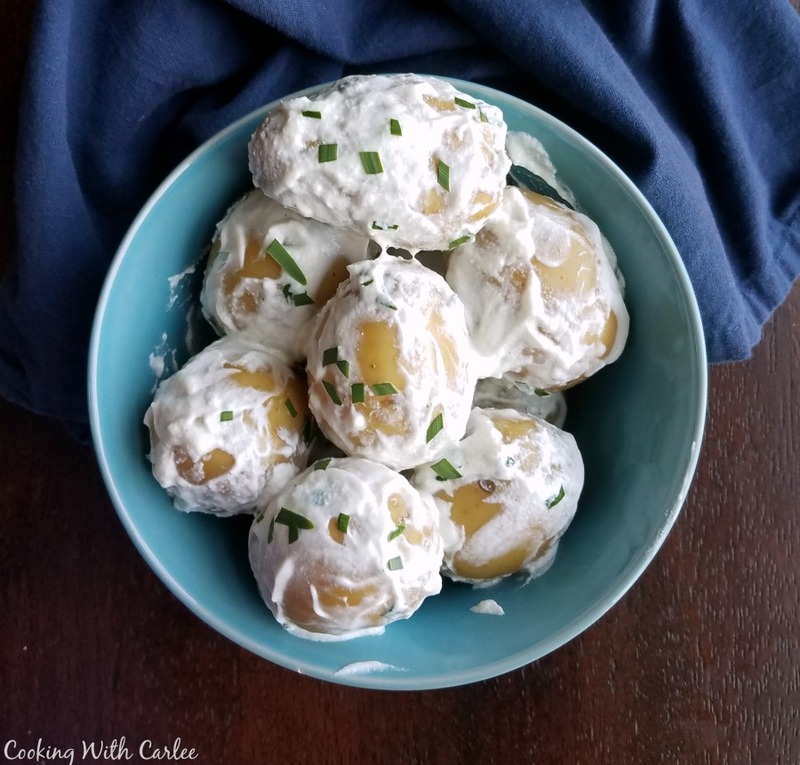 Dress potatoes with sour cream and chives, tossing to coat. They are best served immediately, but will hold for a little while in the warm pot with the lid on. Hi Carlee, this year I have planted a small vegetable patch and I'm having mixed results. So far my peppers are not doing so well, or rather one day I get excited as there is a healthy looking pepper and the next it's not looking so good. I think I am guilty of over watering to compensate for the crazy heat we are having at the moment. I do envy you all those nice home grown potatoes! One of our neighbours stopped and gave us a big bag of his, fresh from the field and they are so nice. I still have some left so I can try your recipe... Although my chives aren't looking too good in this heat either! Our little garden is actually doing great this year. I'll have to snap a few pictures and share them. I think it has a lot to do with the fact we have a little dude who loves to play with the hose and he knows watering the garden is a good excuse ;-) My parents and brother keep much larger gardens than us, but they are nice enough to share (most of the time!) So we are lucky to have a lot of fresh produce between us. Having been raised in Idaho, (we even had a 2 week potato "vacation" from school, so we could work to harvest potatoes). It wasn't much of a vacation, but it was a good chance to earn some money. Anyway, I thought that I had eaten potatoes every way that there was, but this is a new spin. I'll have to try it. I love the pictures of the harvest and am actually a bit jealous. Thank you for sharing the recipe. Wow! A two week potato harvest "vacation." Our schools basically shut down on the first day of deer season each year, but that's about it! I would imagine you've had a lot of potatoes in almost every way. I am glad that I could share one more. Thank you, Deepika! Sometimes it's nice to have something simple where a few yummy ingredients really shine! All those onions look like our barn when we harvest the onions and get them ready to hang for the winter. 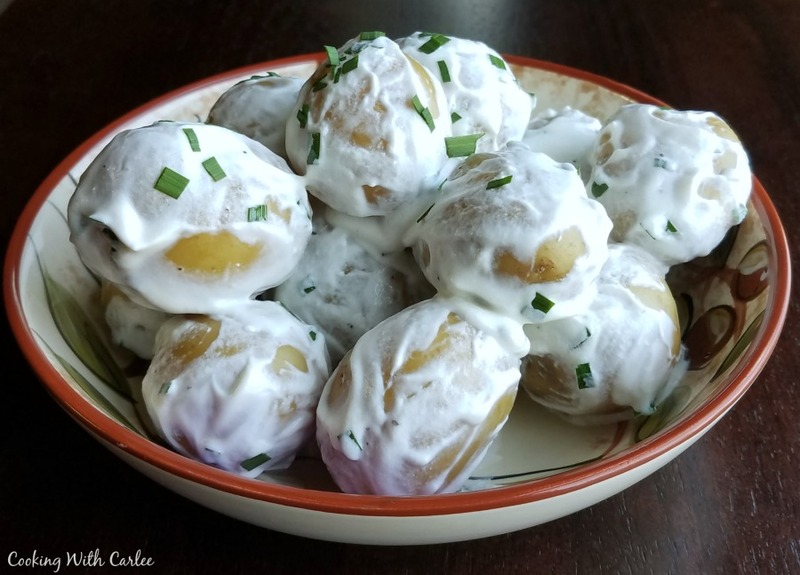 Your New Potatoes with Sour Cream and Chives looks delicious. Thanks so much for sharing with us at Full Plate Thursday and you have a great weekend! It's so much fun to use the harvest! Thanks, Miz Helen! They are really simple, but so good! Thank you so much! Potatoes are one thing we don't have in the garden, but I have to try this so farmers market here I come! We don't either, but luckily my brother overdoes and gifts ;-) The really tender skins just melt in with the butter and sour cream.